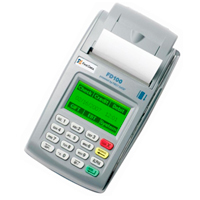 The First Data FD100 terminal is an affordable all-in-one touch screen point-of-sale (POS) terminal solution that combines performance, security and reliability. As one of the fastest, most secure touch screen point-of-sale(POS) terminals available, the First Data FD100 easily integrates, supports various communication interfaces, and can be adapted to changing environments and circumstances. Utilize Customer Fraud Protection functions such as customer, merchant and report truncation features.